Spare5 have changed their payout rules so you can get paid once you’ve earned $1. Here are the details you need to know. In February there were lots of changes at the Spare5 website. I wrote a blog post about how they had increased their minimum payout to $5. Now, I’ve just received an email saying they have changed the minimum payout back to $1! It seemed like a pretty dumb move when the initially changed the minimum payout. I had a look on Twitter at the time and all I saw was negativity. Perhaps people have stopped earning on the website and they’ve had to make the change to entice workers back. No reason was given for the change so who knows why they’ve really decided to change it back. It was a stupid move in the first place! From now on as long as you have at least $1 in your Spare5 account you’ll get paid 5 pm PST each Friday via Paypal. Lovely! UPDATE: A few days after the announcement I received a payment from the company so I can confirm that the new minimum payout is enforced. 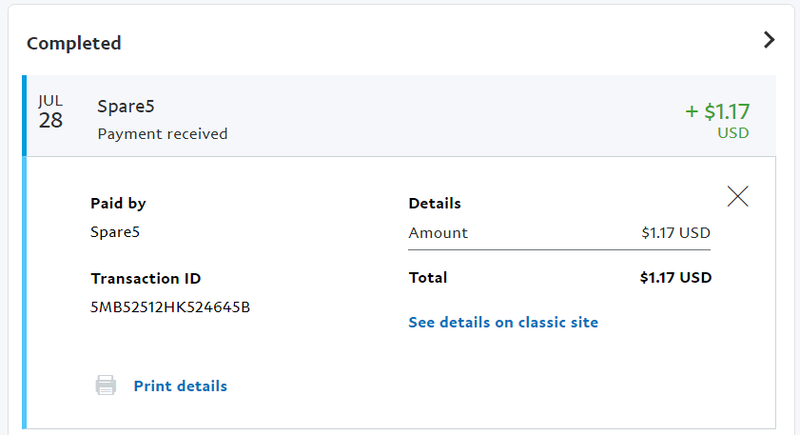 Here is a payment proof screenshot.